FREMONT, Calif. - Nov. 1, 2010 - Today, Logitech (SIX: LOGN) (NASDAQ: LOGI) introduced the Logitech (R) Wireless Solar Keyboard K750 - the company's first light-powered keyboard. The Logitech Wireless Solar Keyboard powers itself whenever there's light, even indoors, making battery hassles a thing of the past. "The keyboard is still the best input device for typing emails and IMs, updating your Facebook [TM] page or posting responses to your favorite blogs - and the Logitech Wireless Solar Keyboard K750 is the next big innovation in keyboard technology," said Denis Pavillard , vice president of product marketing for Logitech's keyboards and desktops. 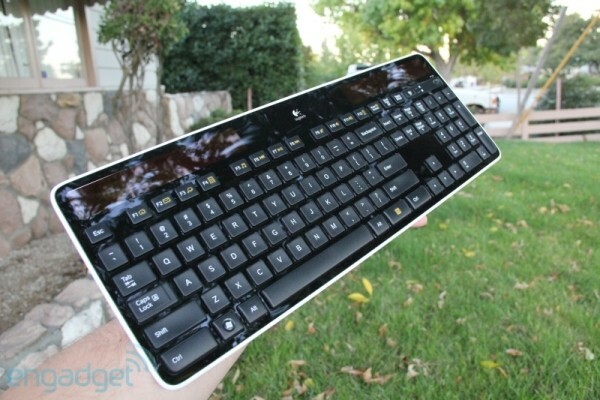 "The Logitech Wireless Solar Keyboard is powered by light but can work in total darkness for up to three months. Plus, with its PVC-free construction and fully recyclable packaging, it's designed to minimize its footprint. " To give you hassle-free convenience, the Logitech Wireless Solar Keyboard powers itself through its integrated solar panel - no power bricks or charging cables needed. The included solar power app (available for download at logitech.com/k750/solarapp) features a lux meter to help you get the necessary light, makes it easy to get at-a-glance information about battery levels, and even alerts you when you need more power. Logitech's first solar keyboard can be powered by indoor light and stays charged for at least three months in total darkness. Plus an integrated power-indicator light eliminates surprises. But Logitech did much more than bring solar power to the keyboard. At only 1/3-inch thick, the sleek Logitech Wireless Solar Keyboard looks good. With its rounded edges and thin profile, this stylish, streamlined keyboard is a joy to hold and behold. The low-profile keyboard features Logitech Incurve keys [TM]. Using a concave design, Incurve keys support the shape of your fingertips, while helping guide your fingers to the right keys. In addition, the soft, rounded edges make it easy for your fingers to glide from key to key. The Logitech Wireless Solar Keyboard K750 offers Logitech Advanced 2.4 GHz wireless connectivity, keeping you connected with virtually no delays or dropouts, so you get all the benefits of a cord, with the convenience of wireless. Logitech Advanced 2.4 wireless also includes 128-bit AES encryption with the keyboard - one of the highest levels of security available. Plus, the tiny Logitech (R) Unifying receiver is small enough to stay in your laptop, so there's no need to unplug it when you move around. And you can easily add up to six Logitech Unifying and Unifying-ready mice and keyboards - without the hassle of multiple USB receivers. The Logitech Wireless Solar Keyboard K750 is expected to be available in the US and Europe in November 2010 for a suggested retail price of $ 79.99 (US). To learn more about the Logitech Wireless Solar Keyboard K750 please visit www.logitech.com or our blog for more information.